Lately I’ve been sharing some products on Instagram that are currently in my home that I’m loving right now. Here they are for your shopping enjoyment. 1. This geometric pillow designed by Beth Thompson, can be found at RedBubble. You can also get the same print on other products. 2. SoapBox is just awesome. This shelf is great for entryways as well as other rooms with needed hanging storage. 3. I really love this pareo from Serena & Lily. 4. You can get your Instagram pictures put on MARSHMALLOWS! How cool is that?! Introducing Boomf. 5. I love this modern, nautical wallpaper from Kimberly Lewis Home. 6. 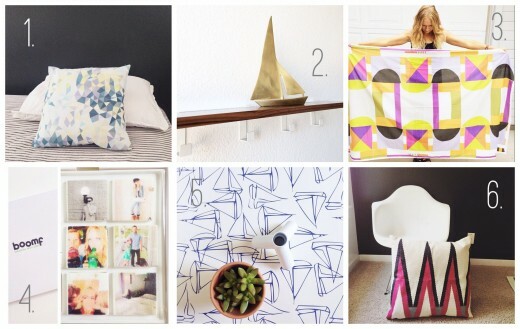 Leah Singh has my favorite pillow collection on the market right now.